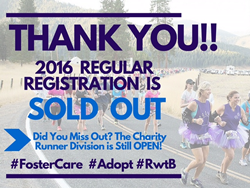 Boston Marathon Qualifying Race in California Sold Out According to Running with the Bears Marathon Director at Mountain Circle Family Services, Inc.
One of the country’s smallest qualifying marathons is still open to Charity Runners who would like to sign up for the upcoming marathon, but there is limited space. We are so excited that this many people want to come run in the Indian Valley, and we have athletes arriving from England, Germany and all over the U.S. The Running with the Bears Marathon, Half Marathon, and 10K has sold out regular registration for the third year in a row, a record 176 days before Race Day. This tiny Boston Qualifying marathon is one of the smallest in the Country and is managed entirely by the Charity it benefits, Mountain Circle Family Services. The 2016 Running with the Bears (RWTB) event, held on Saturday August 20, 2016, will welcome 500 athletes from all over the country and world, plus an additional 100 Charity Runners. Participants who did not register in time can still sign up for Mountain Circle’s Charity Division. "We are so excited that this many people want to come run in the Indian Valley,” says Race Director, Josie Litchfield, “and we have athletes arriving from England, Germany, and all over the U.S. My favorite part is watching the participants pull into our little town and just stop and stare- it's a world away from what they're used too. The fact that they may get chased by a goat during the race, or see a cow be born alongside the course (both have happened), is just part of the experience." Just like in 2015, female RWTB athletes vastly outnumber male participants. The final tally has 342 female participants and 158 male participants -- this is the highest % of female road runners in any race in California. Running with the Bears is the annual fundraiser for Mountain Circle Family Services, a local foster care and adoption agency. Mountain Circle has now opened up a limited amount of registrations for Charity Runners only. To learn more about this program please visit their website at http://www.RunningwiththeBears.org. Mountain Circle Family Services, Inc.